Welcome to Show n Tell Saturdays. We thought of a fun, cute way to involve all you guys on the blog. Without further ado, let’s jump into our very first Show n Tell! This gorgeous thushi belongs to Tanvi – our Growth & Outreach Manager. She and her hubby Sandy have been together for a decade now, of which half the time they were in a long distance relationship! Talk about making things work! Love the dedication that these guys have put into their relation. So, as a little back story: both of them met when they were a bunch of kids. Probably like 17 years old or something, but there were always a few sparks. The binding factor between them was that they both were studying Hospitality Management. She in Goa, he in Trivandrum. 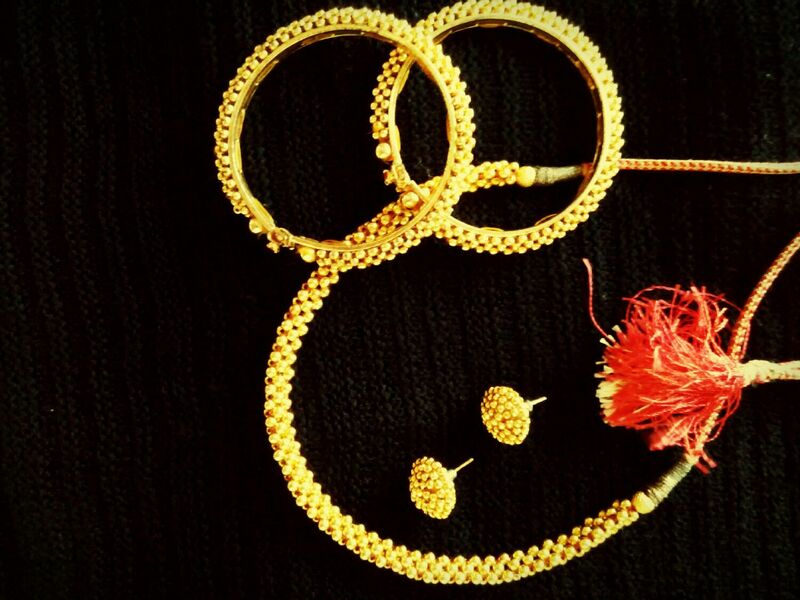 Once he graduated and got a job, he saved up until her birthday to gift her this traditional gold thushi set. Awwww (i just melted) isn’t that cute? We are sure wearing this set invokes so many sweet memories for Tanvi. Lovely u guys! email it on shweta@ethnicthread.com and sit back n relax as we tell your story to the world. Get the app now, and post your pictures there too!